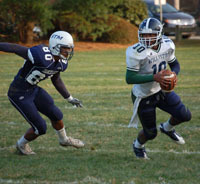 Ledell has been an unstoppable force for the varsity football team all season long. Ledell made an impressive showing against St. Thomas More on Saturday on both offense and defense with 9 carries for 71 yards, (touchdown runs of 15 and 32 yards), 3 for 6 passes for 74 yards (1 touchdown pass of 38 yards), 2 catches for 40 yards, 1 punt return for 17 yards, 4 tackles, and 1 interception. Ledell is a very productive player and has been a difference maker for the football team this year. Liz is a captain of the varsity volleyball team and continuously lights up the court with her team spirit and enthusiasm. Her perseverance through even the roughest of rallies shows how dedicated she is to being a leader and teammate. 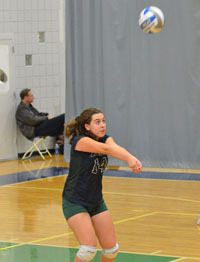 This past Saturday, Liz contributed with accurate and poised sets in the team’s win against Miss Porter’s. Her coaches are continuously impressed with her work ethic and can’t wait to see what she brings next season as a senior. Playing at keeper for the boys jv a soccer team, Terry made numerous high flying saves to help the Wildcats secure ties with Deerfield (0-0) and NMH (2-2) to close out the season. Terry was also between the posts for a dramatic 2-1 win over Suffield on Family Weekend. Terry has been leader on and off the field for the squad this season. A defender for the girls jv soccer team, Molly has anchored the back line with an aggressive and competitive style of play. Contributing to the team’s win this past Saturday against NMH, Molly scored a goal and played strong defense to keep the NMH offensive attack to limited scoring opportunities.